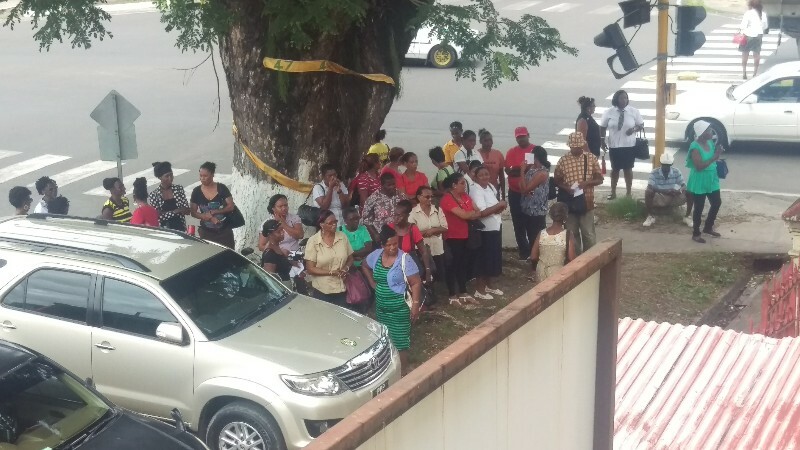 A section of the crowd gathered outside the Georgetown Magistrates’ Court today, March 15. Yet another bail attempt for senior pastor of the Universal Church of the Kingdom of God, Haleno Luiz, was today, March 15, denied when he appeared again before Chief Magistrate Ann McLennan for causing the death of Maurice Moseley by dangerous driving. Police prosecutor Arvin Moore did not object to the second bail application, despite the first bail application being strongly objected to by Police prosecutor, Deniro Jones, who dealt with the matter earlier in March. Chief Magistrate Ann McLennan was at odds on police prosecutor Moore’s swift objection to bail, even though the investigating officers had not yet confirmed a fixed addressed for the accused. Luiz, a 35-year-old Brazilian national, today plead not guilty to the charge which alleged that on March 3 at the intersection of Hadfield and Smyth Streets, he drove his vehicle in a dangerous manner to the public, causing the death of Moseley. 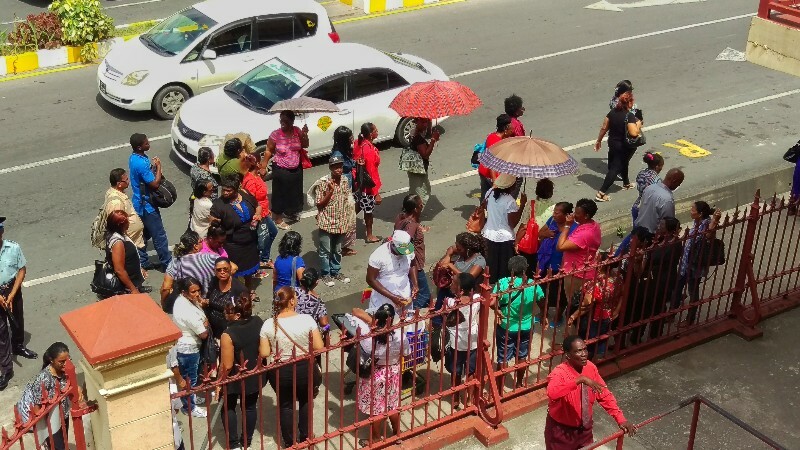 Chief Magistrate’s courtroom was filled to capacity this morning as the family of the deceased, as well as supporters of the Brazilian pastor, gathered for the bittersweet decision of the bail application. Outside the court room, small crowds gathered seemingly to show support for the pastor and his family. Inside the courtroom, police prosecutor Moore, after concerns raised by the Chief Magistrate, then requested that the matter be stood down for two weeks so that ranks could confirm the address of the accused. Another section of the gathering. Chief Magistrate McLennan denied the bail application saying she was not satisfied with the address placed in the immigration system, which was the address of one of the churches and not the accused’s home address. Luiz’s new attorney, Mark Waldron, told the court his client’s address is listed as Charlotte and Wellington Streets because the church was the organisation which applied for the work permit on Luiz’s behalf. McLennan remained unsatisfied saying the accused was a flight risk, and further, the Guyana-Brazil border is easily accessible. When Luiz was escorted down the court steps and into the police outpost, members of his congregation passing by declared, “we love you, pastor!” as they waved their hands joyously as the deceased’s family passed by in tears. Luiz, a well-known televangelist, has television programmes on Channels 9, 11, and 69, which airs in Georgetown, Demerara, and Berbice. The court had heard at the last court hearing that Luiz moved to Guyana three years ago spreading the word of God. He is a resident of Guyana who holds a work permit issued last year. Luiz was however working in Guyana for three years, attached to the Church. At the last court hearing, Police prosecutor Deniro Jones made strong objections to bail. Jones took into consideration the nature and penalty of the offense, as well as the fact that Luiz is not a Guyanese citizen. Jones also told the court then that Luiz had not offered his passport to the authorities, a position which was strongly rejected by Luiz’s lawyer who told the court his client was never asked to submit his passport during the investigation on Friday. Jones told the court that Luiz, on the day of the incident, was proceeding east along Hadfield Street at a fast rate when he failed to stop at Smyth Street, hitting the deceased who was riding his motorcycle. Moseley was reportedly taken to the hospital, according to the police prosecutor, where he was pronounced dead on arrival. The police file is still incomplete as the post martem examination was still outstanding.